Home/Science of Sound/Sound Movement/How does sea ice affect how sound travels? Sound speed increases with increasing temperature, salinity, and pressure, though salinity has a relatively small effect on sound speed. In polar regions, the water column has a nearly uniform temperature compared to temperature variations in mid-latitudes. Consequently, the increase in pressure with depth tends to be the dominant oceanographic variable affecting sound speed in polar areas. The sound speed increases with depth, creating a sound-speed minimum at the surface. A sound wave traveling through the ocean is refracted (bent) by changes in the speed of sound. Sound waves are continually refracted toward the region of lower sound speed. In polar regions, sound is bent toward the sound-speed minimum at the surface, where it reflects from the surface but is then refracted back towards the surface again. Graph showing sound speed and path of travel through the water column for polar sound-speed profile and ray diagram for on-axis sources. On the left is a plot of sound speed as a function of depth. On the right are the paths followed by sound waves as they travel away from a sound source located at the surface. Only rays that do not hit the seafloor are shown. Image from Figure 2.3 of Munk et al., 1995. Transmission loss has three components: spreading, scattering, and attenuation. In regions covered by sea ice, the interaction of sound with the ice affects transmission loss. If the underside of the ice were smooth, most of the sound energy would be reflected. However, the underside of sea ice tends to be rough, which scatters some sound energy. In addition, some sound energy travels from the sea water into the ice, where the attenuation is higher. Due to this scattering and attenuation, sound weakens more rapidly and does not propagate as far from a source in polar regions when sea ice is present. The transmission loss depends on the frequency of the sound, with the acoustic intensity decreasing more rapidly at higher frequencies than at lower frequencies as the range from the source increases. 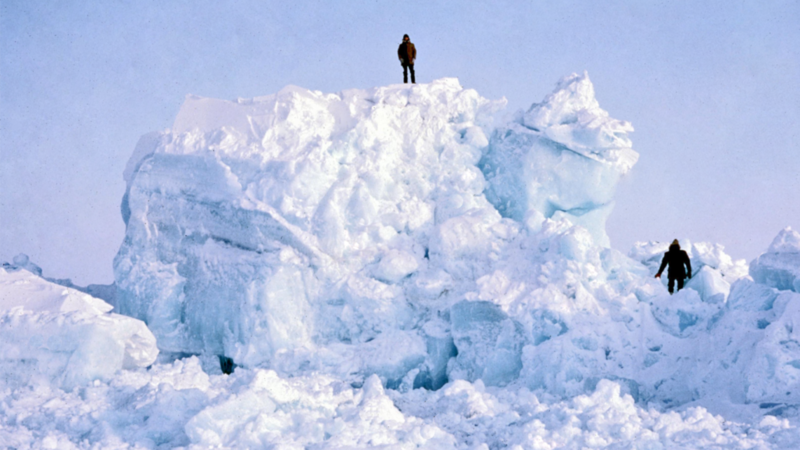 Pressure ridge near the FRAM II ice camp in the central Arctic Ocean at about 86ºN, 25ºW in April 1980. Credit: Arthur Baggeroer, MIT. Extensive research on acoustic propagation in the Arctic Ocean was conducted from the 1960’s through the 1980’s during the Cold War between the United States and the former Soviet Union. At that time, much of the sea ice in the Arctic persisted from one winter to the next, forming multiyear ice. The multiyear ice consisted of relatively smooth floes with pressure ridges that were formed as the ice floes were compressed by winds and currents. Underneath the pressure ridges, ice keels extended as much as several tens of meters into the water column. Deep ice keels scattered or blocked sound at higher frequencies, typically limiting long-range propagation to frequencies below about 30 Hz. With global climate change, the Arctic has warmed and the extent of multiyear ice has decreased dramatically in recent years. Further, ice thickness throughout the Arctic has decreased substantially. With these changes to Arctic sea ice, its effects on how sound travels can be expected to be significantly different now than during the Cold War. Higher frequency sound can likely travel to much longer ranges than was previously the case. Science of Sound > How fast does sound travel? Science of Sound > Why does sound become weaker as it travels?